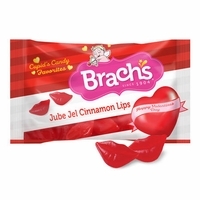 Brach's cinnamon lips Valentine candy. Jube cinnamon lips. A chewy cinnamon flavored candy in the shape of lips. These have a great cinnamon flavors for those who like cinnamon candy. We also carry Cinnamon Hearts, Jube gel cherry hearts and sour Cherry balls all made by Brach's.